Wissy's blogspot: Wanted. Another collective noun. 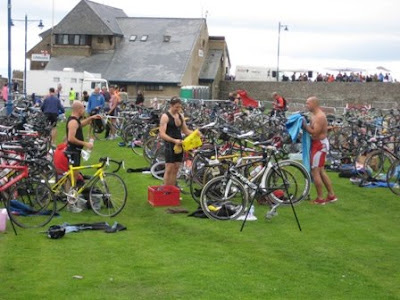 The aftermath of a triathlon at Porthcawl. My obsession with collective nouns continues apace! We came across these athletes after they had finished a Triathlon. My question is what is the collective noun for a large group of bicycles? My humble offer is a "spoke" of bikes or bicycles. If you can come up with a better expression leave a comment. I am still looking for additional collective nouns for lifeguards and blondes.